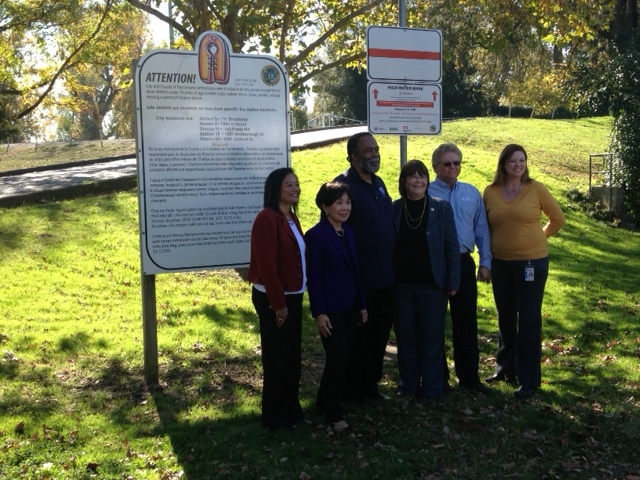 Last Friday was a day of great for progress in the communication of residual flood risk in California as the High Water Mark from the February 19, 1986 flood was unveiled in Garcia Bend Park in “the Pocket” area of Sacramento. The Pocket is a neighborhood in a deep floodplain protected by levees. The signs are part of the “Know Your Line” national initiative—a multi-agency effort, led by FEMA to post high water marks from past floods around the country and increase community awareness of flood risk. California is one of 6 or so pilot communities across the US and a total of 9 or 10 markers have been posted in both Sacramento and Roseville. “We will always face the threat of flooding in Sacramento,” said Tamboor Ellen with the Sacramento District Corps of Engineers. Standing in front of a levee, her words were bold, honest, and very fitting with both the legislatures’ passage of the Central Valley Flood Protection Act in 2008 which requires flood risk notification in levee-protected areas, and with California’s Flood Preparedness Week, November 4-8, 2013. While risk communication in all flood prone areas is critical, the High Water Mark in the Pocket area, is especially important because it acknowledges the risk of flooding in an area protected by a levee— areas where often a false sense of security develops. As previous studies have mentioned, the NFIP also requires no building restrictions, no flood insurance, or flood hazard disclosure on lands protected by levees—so long as the levees are accredited by FEMA. The agencies behind California’s effort included: FEMA, the USGS, the US Army Corps of Engineers, the California Department of Water Resources (DWR), the City of Sacramento, and the City of Roseville. Political pressure, and fear of depressed home prices or lack of economic investments cause local officials to keep flood risk quiet. Given the difficulty in communicating flood risk to the public, and the challenges that cities must face in wanting to maintain an attractive place to build and live, while ensuring their residents are as prepared as possible–I think we should applaud those communities that do take it on, and find out how to help others do the same. To learn about how other examples or about how your community can participate, please go to this link or contact me and I’ll put you in touch. The rollout received a good crowd with some participation of the general public—though it seemed a majority of participants were members of the agencies themselves. The agencies staffed the booths to answer questions from the general public and pour water over a clever model to show how rivers cause damages to property. 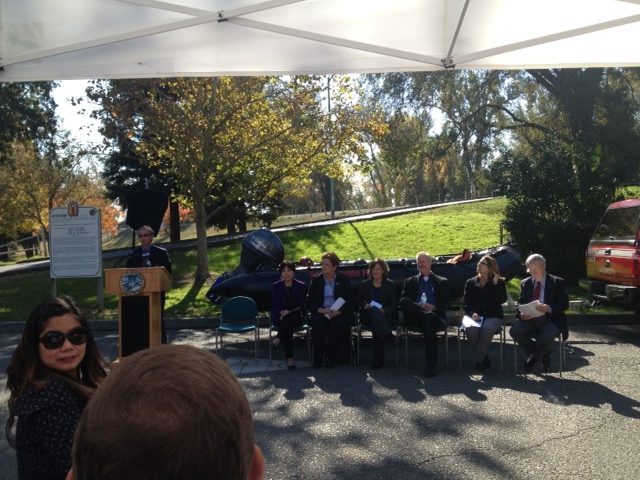 All partners gave a speech including Congresswoman Doris Matsui, a champion of structural flood protection for the Sacramento area. Many speakers acknowledged the ease with which we forget the flood when we haven’t seen one in years. Bill Edgar, President of the Central Valley Flood Protection Board, joked about how many flood control officials working for DWR (and the Corps of Engineers) live in the Pocket area (designated a “rescue” zone on the flood maps because it could flood very deeply and very rapidly without sufficient time for evacuation), —he said they all understand the risk and it gives them a vested interest in keeping it dry. You might wonder the same about the number of DWR employees living in Natomas. Keith Swanson of DWR grew up in the area and he said that what he remembers of the river was that “children were on one side of the levee—water was on the other side.” He recalled that before the 1986 flood, his family kept life jackets by the door. Further thoughts? Great event and many Kudos to the efforts at the USACE Sacramento District (namely Judy Soutiere) and DWR Flood Risk Communications team who were the driving forces behind this and other flood risk preparedness events throughout the region. I am also regularly inspired by the increasing number of state and federal officials who express that risk communication is high on their priority list. I hope high water marks get posted more frequently—and better yet, in residential neighborhoods–not just parks and fire stations– so that would-be homebuyers can get a sense of where they are buying a home and so that people in the neighborhood get daily reminders. This may not guarantee a different home-buying decision, but at least it will get more people in the community thinking about it. Let’s all appreciate for a moment how the podium and speakers were positioned in front of an inflatable boat. City Councilman and the other speakers sitting in front of inflatable rescue boat. 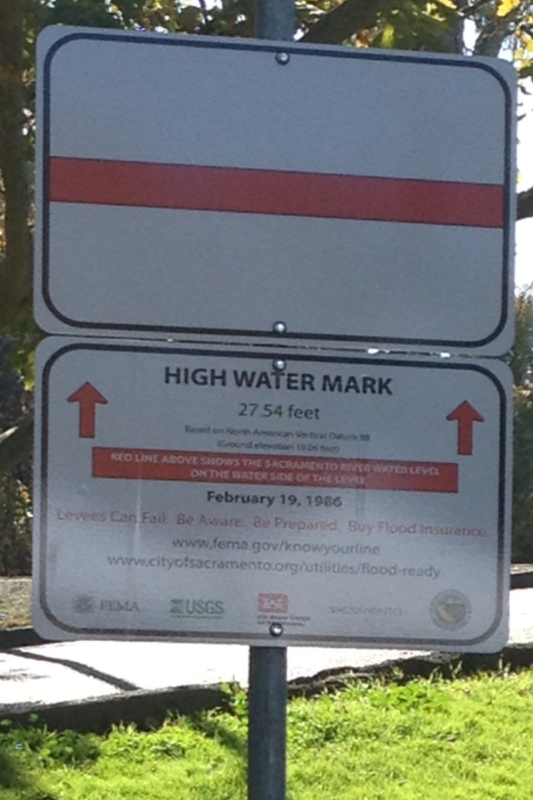 Maybe the high water mark sign should read: Levees will fail. Be prepared, buy a boat. 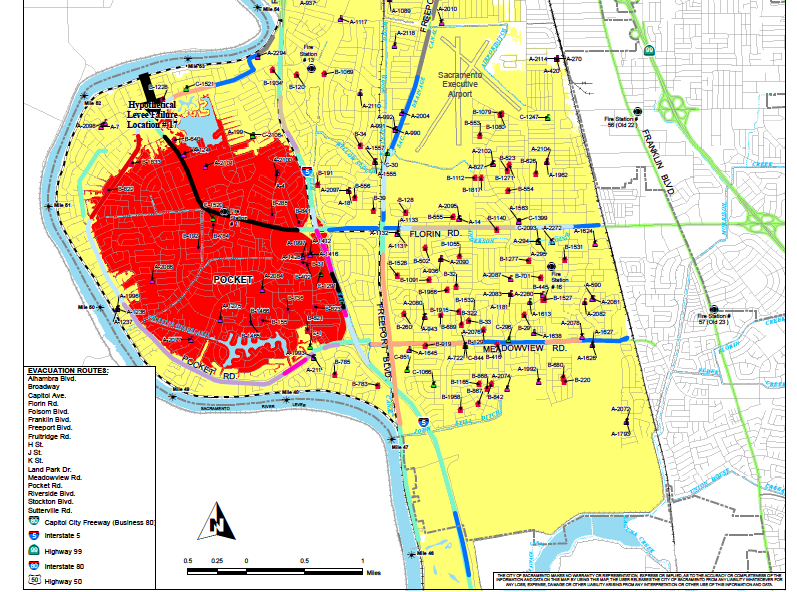 This entry was posted in Flood Risk Management, Flood Risk Perception, Uncategorized and tagged Central Valley Flood Protection Board, communication, consequences, flood risk, flood risk perception, levee, residual risk, Sacramento, United States Army Corps of Engineers. Bookmark the permalink.